What is the PC and who can be a Member? Our Parents’ Club exists to enhance our children’s educational experiences, by encouraging active participation, mutual friendship, and a spirit of cooperation among our parents, teachers and the community. 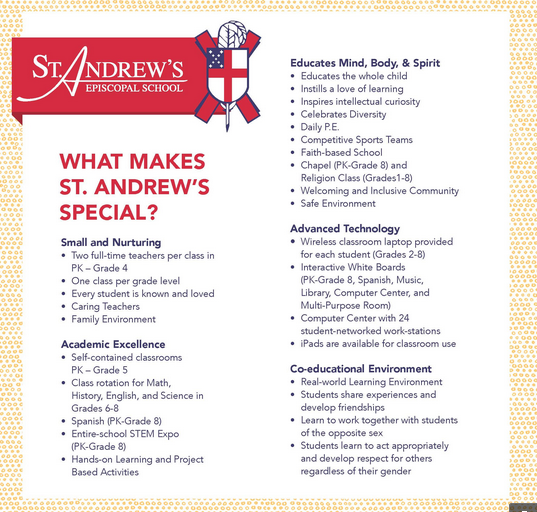 All parents with children enrolled in St. Andrew’s Episcopal School are automatically members. A primary objective of our PC is to provide our school with funds, programs, and resources that will enrich and maximize the education of every child. To meet this important objective, and afford services that are not covered by our school budget, we offer several fundraisers throughout the school year. Bingo Night – join us for a night of family fun this fall! Bingo cards, dinner and drinks will be available for purchase. Pizza Day Fundraisers – Delicious pizza can be purchased by the slice or pre-order a whole pizza to take home for dinner on September 13, and March 21. Check DirectorySpot under Parents’ Club for names and contact numbers to ask questions, purchase spirit items, or volunteer.